O.J. 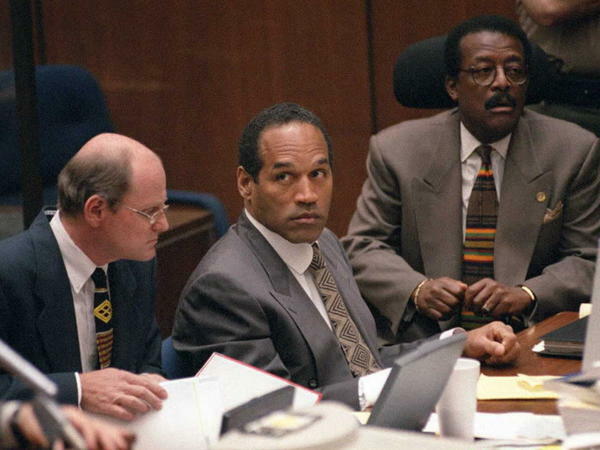 Simpson sits with his attorneys Johnnie Cochran Jr. (right) and Robert Blasier (left) during a court hearing in the O.J. Simpson murder trial. One of the most notorious, oft-watched moments in the O.J. Simpson murder case was his nationally televised slow-speed escape from police on the freeways of Los Angeles in a white Ford Bronco. It's a testament to Ezra Edelman's riveting, unsettling five-part ESPN documentary O.J. : Made In America that the filmmaker finds a new lens through which to view it: the real-time collision of a city's sordid racial history with one black celebrity's seeming lifelong project to sidestep the tidal forces of race in America. In the documentary, friends and acquaintances recall O.J. telling them, "I'm not black, I'm O.J.!" We see a young O.J. Simpson pointedly eschewing racial politics when other prominent black sports heroes — Bill Russell, Jim Brown, Muhammad Ali — were using their platforms to denounce racial injustice. We marvel as O.J. becomes the first black athlete to serve as the pitchman and face for major national brands like RC Cola and Hertz Rent-A-Car, while noting that his ads were otherwise devoid of black people — and deliberately so. We see middle-aged O.J. ensconced in the tony, almost exclusively white Brentwood neighborhood of Los Angeles, a proud, well-liked member of all the right, white clubs — clubs that were otherwise averse to letting black folks in. At his estate, O.J. charms local police officers by inviting them over for barbecue, in the same city that burned during the Watts riots of the 1960s and again after the Rodney King beating in 1992. And so, we get to the Bronco chase in 1994, a fleet of LAPD patrol cars trailing O.J. with a kind of deference not typically extended to black folks, let alone the primary suspect in a gruesome double-murder. If O.J. hadn't succeeded in outrunning the poverty of his childhood and his blackness, he'd managed to get pretty damn close. A helicopter pilot filming the chase for local news that day told Edelman that she had covered dozens of police chases before, and had never seen the LAPD handle a situation like that with such restraint. "If O.J. Simpson were black," she says, "that s*** wouldn't have happened. He'd be on the ground getting clubbed." I remember watching this case unfold as a teenager and the exasperation and ambivalence with which many old heads in my life viewed O.J. They had no affinity for this dude who they saw as having no particular affinity for black people. And anyway, they seemed certain that there was no way Simpson would get off, recalling the many times, some within their own lifetimes, that even the insinuation of the crimes Simpson was accused of — that is, crimes against a white woman — might have cost a black man his life, with or without a criminal trial. Edelman shows the way Simpson's defense team — and especially Johnnie Cochran, the flashy LA attorney who spent his career crusading against police violence — decided to make the Simpson case a proxy fight over racial animus in the LAPD. And whatever their feelings about Simpson in particular, this was the kind of real talk that black folks in my life, and around the country, were ready to hear. LAPD officers were widely seen as villains who had tormented black Angelenos for decades with the imprimatur of the state, and O.J. 's "Dream Team" didn't have a hard time painting him as deeply sympathetic in comparison. O.J. being O.J., though, his lawyers had to basically manufacture aspects of blackness out of whole cloth to pull this off. In one incredible scene from the documentary, his defense team literally redecorates his house to make it look like O.J. spent a lot of time socializing with black folks. They take down the copious pictures of O.J. with his country club golf buddies, and put up ones of him with his kids from his first marriage — and The Problem We All Live With, the Norman Rockwell painting of a 6-year-old black girl named Ruby Bridges escorted to school by U.S. marshals while white anti-integration protesters scream at her in the background. The defense team was gifted with a radioactive prosecution witness, a police detective named Mark Fuhrman who had been extensively recorded using racial slurs and boasting about brutalizing black folks and planting evidence. Once Fuhrman's past came to light, and the jury was allowed to hear a portion of the tapes, it was essentially game over for the prosecution. Almost any high-profile criminal trial with race at the center quickly becomes a proxy fight over race in America, broadly. We fervently hope that the adjudication of the particular set of facts in question in the courtroom might also bring some clarity to the big social and policy questions swirling around them. Of course, these trials are not set up to do that, and any courtroom resolution is doomed to be unsatisfying. But the Simpson case is especially confounding, being so profoundly anomalous that it's hard to imagine what broader lessons can be drawn from it. It involved a black defendant given broad deference by the police trying to put him away. It's a case involving a black defendant in which the prosecution did not do everything it could to keep black folks out of the jury. It's a case in which the defendant's blackness became an asset and not a liability. And ultimately, it was a high-profile case involving race that left many white folks shaken, angry and afraid, while black folks danced in the street, centered on a black man who, for most of his adult life, had studiously avoided associating with the types of folks out there joyously shouting his name.